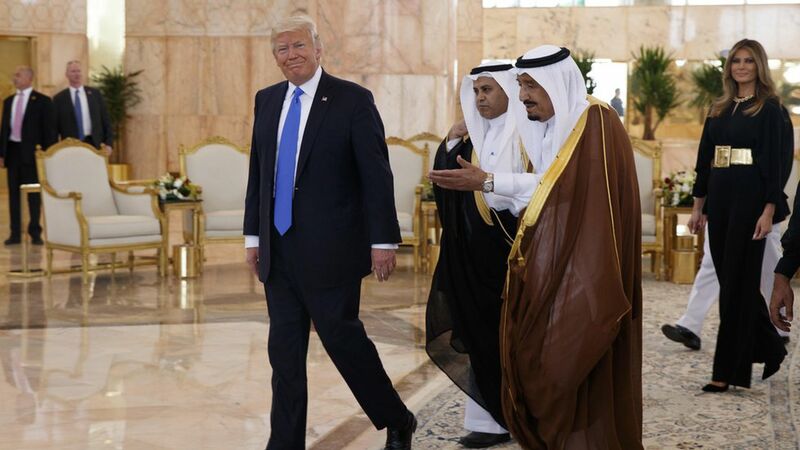 Seeking to reset both his own and his country's relationship with the Muslim world, President Trump will declare Sunday during a major speech in Saudi Arabia that he hopes the United States and Islamic countries can share "a hopeful future" while "stamping out extremism" together. Trump also plans to sign an agreement among the U.S. and Persian Gulf countries to increase cooperation in tracking and prosecuting financiers of terror. Why it matters: Trump's address, to the Arab-Islamic-American summit, follows an administration effort to get the Muslim world to take action in a united front against terrorism. This is part of a White House effort to shape a new Middle East coalition, with the aim an eventual Middle East peace agreement. What he'll say: Trump will tell more than 50 leaders from the region: "Our vision is one of peace, security and prosperity in this region, and in the world. Our goal is a coalition of nations who share the aim of stamping out extremism, and providing our children a hopeful future that does honor God." Another newsy passage from Trump's speech, via the Washington Post's Ashley Parker: "This is not a battle between different faiths, different sects or different civilizations. ... This is a battle between barbaric criminals who seek to obliterate human life and decent people of all regions who seek to protect it. This is a battle between good and evil." The backdrop: The speech at the King Abdulaziz Conference Center follows a busy first day of Trump's maiden international trip, with announcements that aides called proof the administration is capable of results, despite the Russia frenzy back home. The deliverables include what Sean Spicer called the largest single arms deal in U.S. history — a sale of military equipment totaling $110 billion. Axios has learned that on Sunday, Trump will also sign a memorandum of cooperation with Gulf Cooperation Council countries to set up a task force to track funding that fuels terrorism (from both institutions and individuals), with the intention of prosecutions. King Salman of Saudi Arabia is expected to say at at the summit: "I speak on behalf of all my brothers, the leaders ... gathered here today, in saying that we will not hesitate to prosecute anyone who supports or finances terrorism, in any shape or form, and will apply justice to its fullest." The U.S. Treasury Department will be involved in implementation. The message from the administration to the participating countries: You have to share the burden with us in fighting Islamic State terrorism. Later, Trump will attend the inauguration of a Global Center for Combating Extremist Ideology. Projects will include the digital monitoring of the spread of radical ideology, based on a successful model used by the United Arab Emirates.